Early last summer, I sent a quilt to Utah-based photographer Mandi Rae for use in her new daughter's nursery. In exchange for the quilt, Mandi used her talents to capture photos of the quilt alongside its new owner, Ruth. I based the color palette for the quilt on a few mood boards for the nursery that Mandi shared, and selected a range of peach and sage green prints and solids to work with. I made a flying geese quilt similar to those I've done in the past, but instead arranged the geese so as to create an ombré effect. 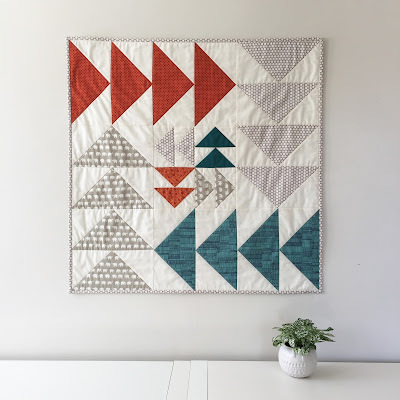 I really enjoyed the challenge of working with a color palette that's new to me, and I especially enjoyed seeing these photos of Ruth with her quilt afterward! Last fall, Spoonflower (my former employer) interviewed me for a small spotlight in their second-ever magazine/catalogue. 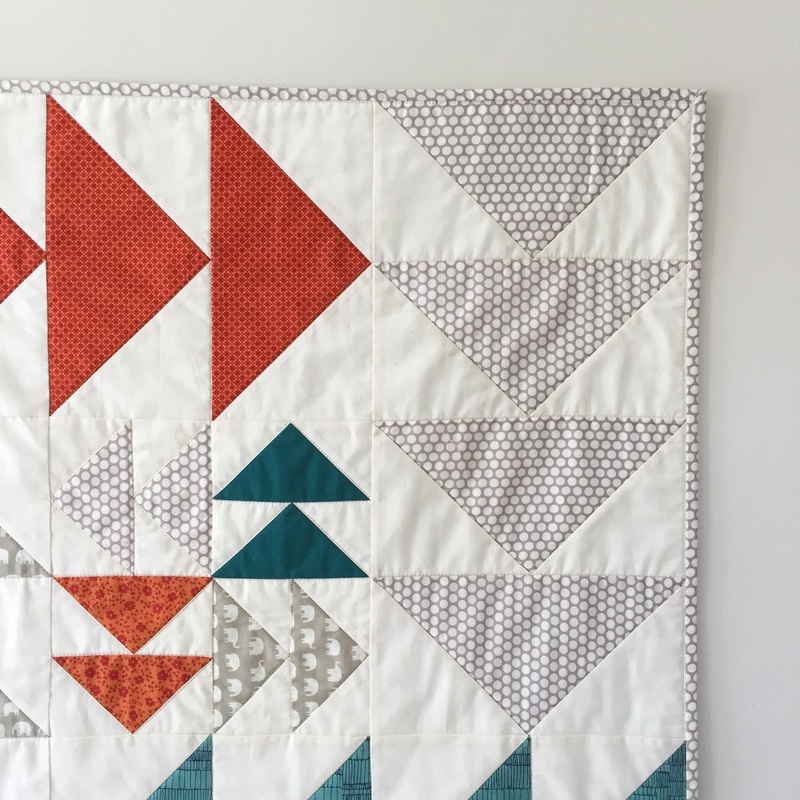 In addition to answering a few questions, I also created two quilts for the publication using a selection of Spoonflower designs printed onto Kona cotton. For the first quilt, pictured above, I pieced together rectangular improv log cabin blocks using a selection of indigo, mustard, and peach prints. I also pulled together a pair of quilted pillow shams at the last minute to round out the bedding. You can see all of the prints I used in this helpful online collection. For the second quilt, pictured folded and under the lamb softie above, I created a flying geese baby quilt using a graphic black-and-white print background and a selection of sherbet-color-inspired prints for the geese. You can see the full collection of prints I used here. Both quilts were beautifully quilted by Sarah at Crinklelove. This was such a fun and different project to work on, and it's been so humbling to hear from so many people who've spotted my work in the magazine. If you'd like to see more, the entire digital publication is available online. Ask any of my quilty friends, and they'll most likely tell you that flying geese are my go-to quilt block---and they would be right. In fact, I created a whole block-of-the-month pattern exclusively for Pintuck & Purl based on the block. Today, I thought it would be fun to show you two of the baby quilts I made last year which feature flying geese in an almost identical layout---geese pointing both north and south with areas of negative space around them---but have a completely different look and feel to them thanks to my fabric choices. For this first one, I used only two fabrics for the top: a pretty, textured blue Essex linen for the background and an off-white mini plus-sign print for the geese. Since the top was minimal and restrained in its color palette, I opted to add a vibrant and patterned back to the quilt, for a fun surprise. For this second flying geese quilt, I reversed the color placement (opting for a light background with darker geese) and added a third color (an assortment of acid yellow prints paired perfectly with solid coral pink and white). The back remained minimal with a gray windowpane print, and I couldn't resist adding in a bit of texture in the form of a recycled hemp and cotton binding. Though these quilts are similar in design, I'm curious to know, do you prefer one over the other? ﻿You can find all of my flying geese quilts from throughout the years here, and you'll find both of the quilts featured here now for sale in my online shop. First three photos by Joyelle West. Last three photos by Lindsay Hite. The flying geese quilt block is one I find myself returning to again and again, because I love how it can be completely transformed through placement, scale, and fabric choices. For example, this baby quilt, which also features flying geese blocks, feels completely different than the one pictured here, because of the block layout. For this latest quilt, I tried out a new flying geese block arrangement---with all of the blocks pointed toward the center---which I discovered I really love. I'm especially drawn to the secondary pattern of a large X (or ><) that emerged when all of the geese blocks were pieced together. What also makes this quilt exciting to me is that it includes scraps from other fellow makers. As my business has grown, so has my network, and I've been lucky enough to connect with many other creative women who run product-based businesses. In this instance, it was conversations with Erin of Cotton & Flax and Catherine of Bayith that led to them giving me the linen scraps left from their production of home goods that I used in this quilt. I paired their gray scraps with other gray linen and cotton fabrics from my own stash, as well as an American-made cotton muslin. The resulting quilt top is neutral, but impactful, thanks to the bold block arrangement. For the back, I used a colorful polka dot with a cream background, which adds a fun bit of color to the otherwise monochromatic piece. This quilt is now at its new home in California, and I'm back to brainstorming new arrangements for the versatile flying geese block. Photo of binding in progress by Lindsay Hite. One of the benefits of making Salty Oat my full-time gig, is that I now have the time to take on commissioned quilts for customers. I was recently asked to make a wall quilt which would be hung above a bed, and needed to work with the room's color palette, which included orange, teal, beige, and gray.